Two businessmen are seeking approval for a hotel that would end plans for an expansion of the Convention Center for good. On Dec. 8, Ray Carpenter and Art Engel visited the Board of Directors of the San Diego Convention Center Corporation to show off a plan that would finally, clearly, officially and totally kill that board’s decade-long push for an expansion at its current location. It was the latest chapter in a long drama between the pair of businessmen, the Convention Center’s leaders and the Port of San Diego. Somehow, some of those leaders believe an expansion could still happen. Maybe a government agency could derail Carpenter and Engel, who were presenting an attractive plan for a large hotel that day. The Convention Center expansion might be smaller than was dreamt up a few years ago. And maybe the government could just take Carpenter and Engel’s land even while it encourages them to build the hotel. It’s not really their land. Carpenter and Engel own the lease at Fifth Avenue Landing. It is a golden ticket. The land is coveted and valuable. It will be a major hotel in perhaps the most advantageous place possible. It would not be the only fortune made on Port land. The partners said their time has come. “We paid for that golden ticket with 30 years of hard work there and millions of dollars,” Carpenter told me. The reticent partners have lately decided to engage the public more. They sat down with me to talk about perhaps the most contentious plot of land in San Diego. The state of California owns the land, and the Port of San Diego is the landlord. 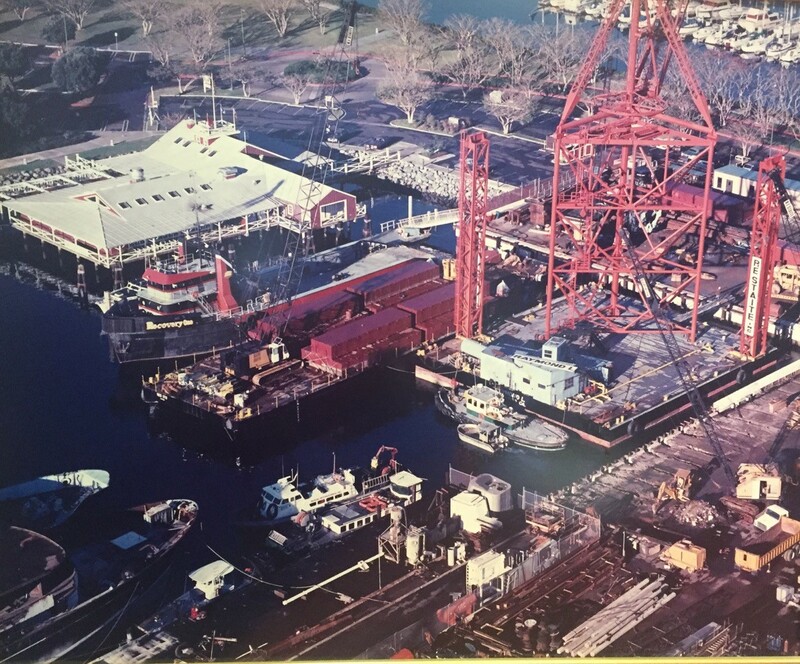 Carpenter has leased it since 1980, when he ran marine construction and dredging operations. Engel is his business partner. The company’s operation was so unattractive that when the Convention Center expanded, officials asked Carpenter to move much of the industrial equipment. Makes sense, who wants to look at this while attending a proctologist convention, amirite? It’s a story as old as San Diego – the fight between smokestacks and geraniums. The smokestacks lost this one. With the industrial uses put aside, Carpenter began to develop the idea of a hotel. It’s a great spot for one. His idea got some legs but then the recession hit. He put it aside. 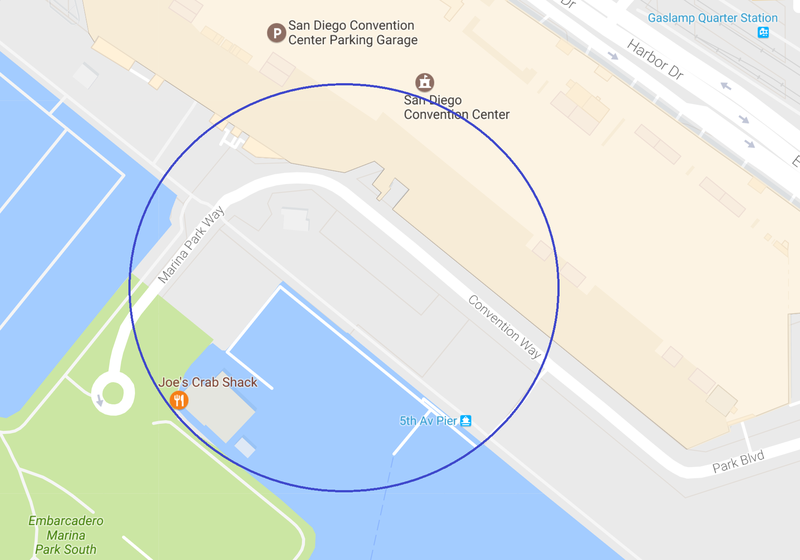 Seven years ago, the Convention Center Corporation and the city of San Diego decided they wanted the land for the expansion of the Convention Center. The two agencies agreed to buy the lease from Carpenter and Engel. The Convention Center Corporation essentially borrowed $12.5 million from Engel and Carpenter and agreed to pay $500,000 each year until 2015, when they’d pay it all off. The Port approved the sale but said that should the Convention Center expansion not happen, the land would have to be turned into a hotel with more than 400 rooms. “We didn’t want it back. We had moved on,” Carpenter said. By 2015, local officials assumed, the Convention Center expansion would be well under way and they would pay off the rest. Seems straightforward. But since then, the plot of land became enmeshed in a broader drama about the future of the waterfront, the tourism economy and the city’s sometimes dysfunctional politics. As the May 2015 deadline to pay off Carpenter and Engel approached, the pair began to wonder what the city and Convention Center officials planned. They asked. And asked. No answer came. Finally, in April, the Convention Center alerted the city that it was about to lose the land and thus the right to build an expanded Convention Center. Carpenter and Engel took the property back but found out the Convention Center had already rented it out for events for several months to come – like scheduling a party for months after your eviction date. Things had fallen apart for the city. Courts rejected the city’s taxing scheme to fund the expansion of the Convention Center. A lawsuit about the project’s design was going forward. The city still owed Carpenter and Engel $10.5 million but decided not to pay. The partners took back the land. “The city gave up their rights to that project. They had it for six years,” Carpenter said. Carpenter and Engel are accusing city officials now – and specifically longtime port and city maven Steve Cushman – of trying to deliberately shortchange them and run out the clock so that they would not have time on their lease to build the hotel the Port demands of them. Cushman said it was not unlike many big real estate deals. If the financing doesn’t come through, the deal falls apart and property owners keep their property. “It was always anticipated that if we could not put the money together, we would not be able to move forward,” Cushman told me. He said that when courts threw out the plan to pay for the expansion of the Convention Center, they couldn’t move forward. “We had no choice but to go into default,” Cushman said. Carpenter and Engel took the land back and began methodically taking their hotel through the process of getting a coastal development permit. “Their new proposed hotel is well thought out and looks like an excellent project,” Cushman told me. But he has a new idea: Cushman wants Carpenter and Engel to consider putting their hotel on top of an expanded Convention Center. “It’s something that we feel could be very successful,” he said. Specifically, we recommend a contiguous convention center expansion with a hotel built above it. The two uses would be served by separate entrances and maintain use of the existing docks as well as new dock spaces. Carpenter and Engel are not – at all – interested in this. They think it’s a clever way to further delay their own hotel until their lease ends. They have eight years left. If they build a hotel, they’ll get 66 more years. If they don’t, well, the Port can do whatever it wants to the property. Another reason they aren’t so hot for the idea of putting their hotel on top of a bigger Convention Center is attorney Cory Briggs and his clients. Briggs and company went to court Dec. 15 to stop the old plans for the Convention Center. Their contention is that it walls off the waterfront, preventing access for the public. If Briggs wins, it would be an unprecedented rebuke for the California Coastal Commission, which already approved the previous expansion plans. It’s the commission, after all, that is charged with deciding whether a project provides the necessary access to the coast. What’s odd is that Cushman, still the mayor’s primary point man on a Convention Center expansion, does not necessarily support that project. If it wins in court, it’s likely still dead. Cushman supports a smaller expansion of the Convention Center now. He says costs have gone up since the city’s failed last try. “I would pursue a smaller project. I would not expect that the footprint would be exactly the same as it was,” he said. It’s a startling admission: Now even the top guy on the project says, at least the old version, is dead. But does even a new, smaller version have a chance? “(Cushman) lives in a fantasy world. There is not going to be any expansion on the waterfront,” Briggs told me in a text message. Even a smaller project would still need Fifth Avenue Landing. Carpenter and Engel are not selling. Recently, a Port commissioner, Bob Nelson, floated the idea that maybe the Port could just seize it through eminent domain. This, of course, did not sit well with the Fifth Avenue Landing guys. The city had the chance to build an expansion and did not. “When you have a situation that was a planned default and then for them to come back and say well, even though we defaulted, now we’re going to condemn it, that’s just not a good fact pattern. That’s certainly not fair dealing,” said Ralph Hicks, the project manager for the Fifth Avenue Landing hotel. For now, Engel and Carpenter will continue to push for approval of their hotel. It will have an 830-room, four-star hotel and another, 166-bed low-cost hostel of sorts. The public access improvements seem to be acceptable to Briggs’ clients. But the Convention Center expansion would die as it rose. Rip Rippetoe, the new CEO of the Convention Center Corp., inherited the drama. “The great news is we have customers begging us for more space. The hard part is we haven’t found the space that satisfies the concerns,” he said.